Hormel Foods Corporation (HRL) produces and markets various meat and food products worldwide. The company operates in five segments: Grocery Products, Refrigerated Foods, Jennie-O Turkey Store, Specialty Foods, and International & Other. The company is a dividend king which has managed to increase annual dividends for 52 years in a row. There are only twenty-six dividend kings in the world, which have each managed to boost annual dividends every single year for at least half a century. Hormel’s last dividend increase was in November 2017 when the Board of Directors approved a 10.30% increase in the quarterly distribution to 18.75 cents/share. Hormel’s largest competitors include Tyson Foods (TSN), Conagra Foods (CAG), General Mills (GIS), Campbell Soup (CPB) and J.M. Smucker (SJM). Over the past decade this dividend growth stock has delivered an annualized total return of 14.20% to its shareholders. The company has managed to an impressive increase in annual EPS growth since 2007. Earnings per share have risen by 11.20% per year. Analysts expect Hormel to earn $1.81 per share in 2018 and $1.92 per share in 2019. In comparison Hormel earned $1.57/share in 2017. The company has stable and growing earnings and dividends and a strong balance sheet. There is a stable demand for food products from customers, who tend to stick to brands they know. This leads them to make repeatable purchases over times. The company offers a diverse line of products in a variety of categories through its various segments such as refrigerated foods, grocery products, branded and unbranded turkey products, specialty foods and international segment. Future growth in earnings per share can be generated by strategic acquisitions, as well as expanding international presence. Recent acquisitions include Justin LLC, which was a producer of snacks, as well as Applegate Farms, which was a natural and organic value added meat manufacturer. 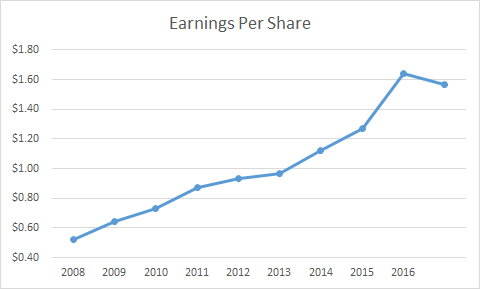 The annual dividend payment has increased by 16.30% per year over the past decade, which is higher than the growth in EPS. The expansion in the dividend payout ratio allowed the company to raise distributions at a rate that is higher than earnings. 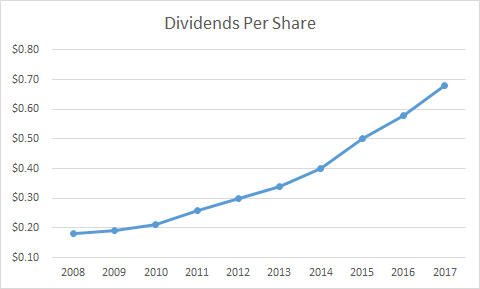 A 16% growth in distributions translates into the dividend payment doubling almost every four and a half years. If we look at historical data, going as far back as 1992 we see that Hormel has actually managed to double its dividend every six years on average. 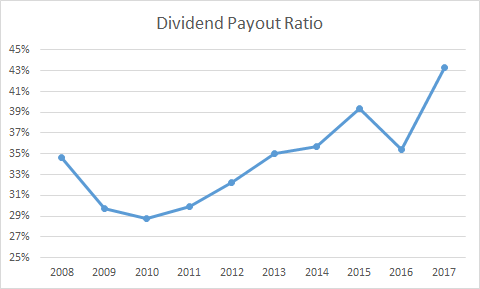 The dividend payout ratio increased from 35% in 2008 to 43% in 2017. A lower payout is always a plus, since it leaves room for consistent dividend growth minimizing the impact of short-term fluctuations in earnings. The largest shareholder is the Hormel Foundation. The Hormel Foundation holds 48% of Hormel's stock and has the majority of its assets in Hormel. The Hormel Foundation generates $193 million in annual dividend income from their Hormel investment. This is the third company I have analyzed, where a foundation holds a large block of the stock in a quality dividend paying company for decades. The company's business model is stable, and it tends to deliver growing dividends to its shareholders. Foundations like the Hormel Foundation, Hershey Trust and Kellogg Foundation (K) are long-term endowments which have been "living off dividends" for decades, and have not run out of money. In other words, these foundations have been "retired" for quite some time. Future retirees should learn this model, and try to apply it toward their retirement planning. The secret sauce is buying into companies with stable business models that are not subject to rapid changes in the industry. These are the companies that tend to deliver dependable and growing dividend income for generations of their investors to live on. Currently, Hormel is slightly overvalued 20.90 times forward earnings, has an adequately covered dividend and yields 2.30%. 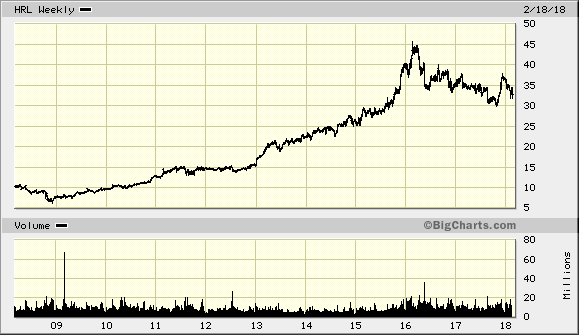 The stock would be a good value on dips below $32/share. Using forward earnings estimates, Hormel may be a decent value below $36/share. As usual, the lower the entry price, the higher the expected returns and the higher initial yield locked at the time of purchase.